The team behind Super Junior's Super Show 2 tour is planning a third concert for the popular Korean group. The huge turnout of invited guests at the Super Junior's press conference last Saturday, April 10, was a calculated move on the part of the promoters and not the other way around, as previously reported. "We deliberately invited more than what the capacity of the venue is because that is what the Super Junior wants. They want it crowded and with lots of people standing in the back... Not too formal but overflowing. So that's the reason," Happee Sy of Pulp Live Productions wrote to PEP (Philippine Entertainment Portal) via Facebook. 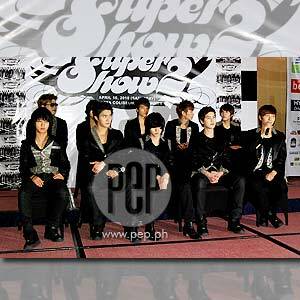 Super Junior—a popular Korean boy group—held a press conference at the Palawan Function Room of the Edsa Shangri-La Hotel in Mandaluyong City, and was greeted by more than a handful of media representatives along with fan groups composed of Filipinos and Koreans. The K-Pop sensations concluded their Super Show 2 tour with a successful concert at the Araneta Coliseum in Cubao, Quezon City on Saturday evening. Sy even revealed that some of the group members were feeling under the weather when they arrived here in Manila on the eve of the concert: "We had to let them rest or the show might be jeopardized." SM Entertainment (Star Museum), the management group that handles the band's career, is said to be strict when it comes to "implementing rules in promoting its talents," and to avoid any problem, concert promoters have to adhere. During the concert, Super Junior hinted the possibility of mounting another concert. "We are working on Super Show 3," revealed Sy. "We just got to gather more fans because they don't like singing on an empty arena. They like it sold out or no show, so we are exerting all our efforts to gather more new fans." Sy added that the boys of Super Junior all had a great time during their stay here in the country. "They loved the cooperation we gave them when they wanted silence."